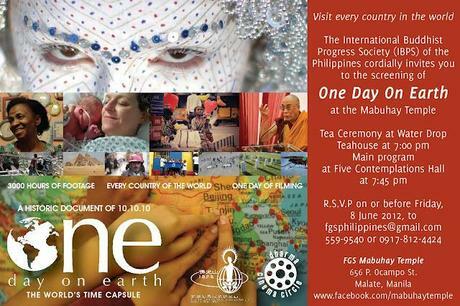 One Day on Earth, the first film to include footage from every country on earth all captured in one day, will be shown for free at Mabuhay Temple on 11 June 2012 at 7:30 pm. The International Buddhist Progress Society, Manila (IBPS) will host a free public screening of One Day on Earth at the Five Contemplations Hall of the Mabuhay Temple on 11 June 2012 at 7:30 pm. Mabuhay Temple is located at 656 Pablo Ocampo St., Malate, Manila. 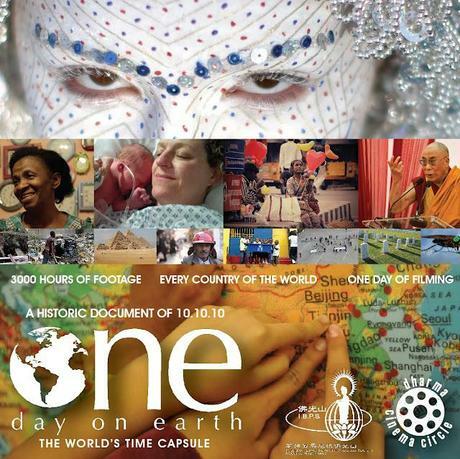 One Day on Earth is a full-length documentary feature that holds the distinction of being the first film ever to include footage from every country on earth, all captured on a single day - 10 October 2010. The film provides a unique look into a wide array of human activities and even offers intimate access to rarely seen images from countries such as North Korea, Iran and Kosovo. The film was able to beautifully capture the interconnectedness of human beings by showing the shared triumphs and challenges of all people on earth. The film's director and founder Kyle Ruddick and co-founder and executive producer Brandon Litman, with the support of the United Nations and a global community of filmmakers, has succeeded in creating a video time capsule of one day on planet earth, making the documentary a great achievement, not only in film making, but also in human cooperation. IBPS is honored that Mabuhay Temple was selected as one of the few venues to screen One Day on Earth in the Philippines. IBPS is an organization affiliated with the Fo Guang Shan (FGS) Buddhist order based in Taiwan with Mabuhay Temple being its branch temple in Manila. Other FGS branch temples in the Philippines are located in Cebu, Bacolod and Iloilo. Apart from regular Buddhist prayer services, Mabuhay Temple regularly holds other activities such as lectures, open mic events, film screenings, temple tours, study groups and short educational programs. For more information about the One Day on Earth screening and other activities of Mabuhay Temple, please check out the temple's Facebook page at https://www.facebook.com/mabuhaytemple. You can also send an email to [email protected]or call 559-9540.